A basic tee shirt is the staple of warm weather trips, and Craghoppers’ Thea is a no-brainer to pack. The cotton and linen jersey fabric wicks away moisture and is machine washable and quick-drying. Price and Where to Buy the Craghoppers’ Thea: Available for $35 on Amazon and Craghoppers’ website. Usefulness: 10/10. The Thea tee can work for a hike or with a skirt for a nice meal out, and packs well. Value: 7/10. $35 is on the expensive side for a shirt, but this is well-made and will last. Cool Factor: 10/10. 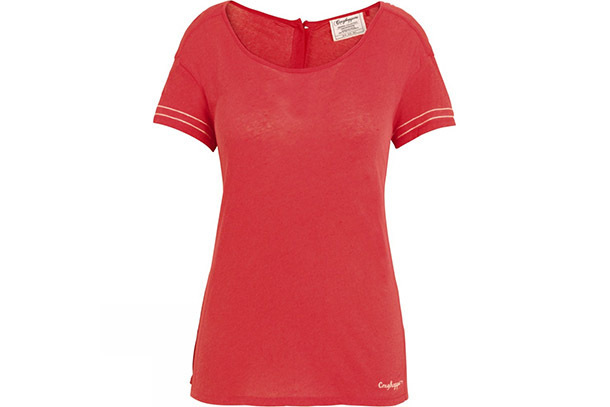 The Thea tee looks great and will keep you cool even in the hottest climate. Final Verdict: Need a versatile tee shirt for trips? Craghoppers’ Thea tee shirt packs well and works overtime to keep you dry.